John Law, one of the original three owners of the Burning Man event, contacted me to let me know that he is just filed suit against his two Burning Man partners Larry Harvey and Michael Mikel, after Michael initiated his own legal proceedings and demand for arbitration. 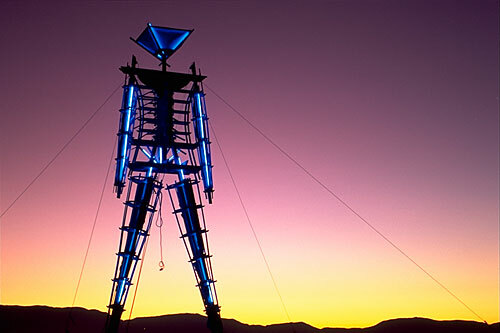 In 1997 Paper Man LLC was formed between the three original owners in order to own and control the name and service mark “Burning Man”, which is at the center of this dispute. This is a statement from John Law regarding this lawsuit from his blog, which he recently launched in order to have a public voice regarding this issue. Full Disclosure: John Law is one of Laughing Squid’s business partners and a close personal friend, but that relationship is independent of his legal involvement in Burning Man. I met John in 1995 through the San Francisco Cacophony Society and in 1999 he was involved in the formation of Laughing Squid LLC (Laughing Squid’s current business structure) along our third partner David Klass. I’m a big supporter of Burning Man. I attended the event for 8 straight years (1995-2002) and I plan on returning again in the future. The bottom line is that I am staying neutral on this issue. I’m good friends with the three people involved and hope they find a amicable resolution to this situation. 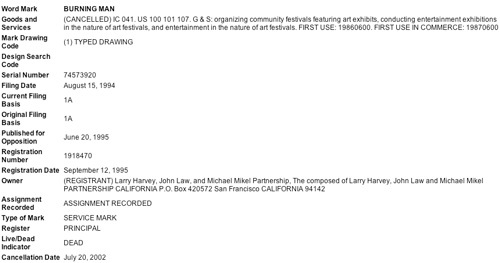 Here’s the original Burning Man service mark that was owned by Larry Harvey, John Law, and Michael Mikel. It was registered on September 12, 1995, canceled on July 20, 2002 and then later assigned to Paper Man LLC in 1997. 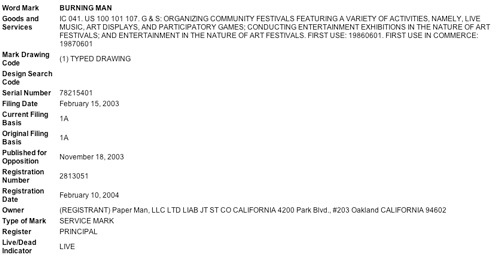 Here’s the current Burning Man service mark that was assigned to Paper Man, LLC in 1997, allowed to expire, and registered again to Paper Man, LLC on February 10, 2004. For more background on John Law’s involvement with Burning Man, check out Brian Doherty’s excellent book “This Is Burning Man”. It provides some great insight on what really went down during the volatile 1996 event and it’s aftermath, which lead to John leaving the organization. UPDATE 1: There’s a really good comment thread developing on John’s initial blog post. It’s a great place for feedback if you have any for him. UPDATE 2: Andie “Actiongrl” Grace responded on behalf of Burning Man on the Tribe thread. UPDATE 3: John has updated his blog with a second post that addresses some of the questions being asked about this case. UPDATE 4: The story has hit the AP Wire. an official response to John Law’s complaint. UPDATE 6: In addition to the PDF of John Law’s complaint, I have also uploaded an HTML version. UPDATE 7: John Law’s attorney I. Braun Degenshein is quoted in the New York Post article. UPDATE 8: There is a humorous thread on Tribe where people are suggesting alternate names for Burning Man. UPDATE 9: Kevin Evans made a great post on Tribe that gives a really good historical insight into how Burning Man moved from Baker Beach in San Francisco to Nevada’s Black Rock Desert, as well as how “art” became one of the primary focuses of the event. Over the years I’ve often told people about Kevin’s significant contributions to the desert beginnings of Burning Man and now it is great to finally see it in his own words. UPDATE 10: John Law just posted his “Smoking Gun”, a PDF of Michael Mikel’s demand for arbitration. UPDATE 11: Newsweek has published “Heart Burn” an article by Jessica Bennett about the “Burning Man” name dispute and lawsuit. In the article she interviews Brian Doherty, senior editor of Reason Magazine and author of “This Is Burning Man”. On the same day the San Francisco Bay Guardian published an article, “Burning brand” by Steven Jones. UPDATE 12: There is even more coverage on this issue from both the San Francisco Weekly and San Francisco Chronicle. UPDATE 13: Chris Messina weighs in with an excellent analysis of the “The Burning Man trademark controversy”.